Nasi goreng sold at a hawker’s stall in the Old Town in Jakarta. The first thing that comes to mind when I think about Indonesian cuisine is usually spicy food and hot sauces—sambal to be more precise. Sambal is a chili-based sauce used in traditional Indonesian fare, either used in the preparation of local dishes or as an accompanying condiment. Satay, gado-gado, soto and curry dishes are also a favorite among the locals. Satay is more commonly known as barbecued meat that is skewered on a stick. Gado-gado is a vegetable salad usually dressed with a sweet peanut sauce dressing and garnished with rice crackers similar to our kropek. Soto, on the other hand, is a clear soup that typically consists of meat and vegetables. 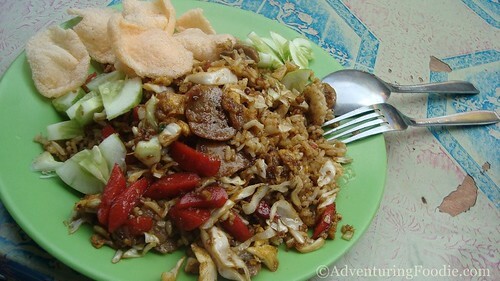 But among Indonesia’s traditional dishes, the most popular one in the country is the nasi goreng. Nasi goreng literally means fried rice and can be said to have been influenced by Chinese cuisine. 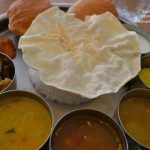 This versatile dish can be cooked in many different ways and as such, there is no fixed or definite recipe for it. Delicious siomai dish I’d had in the market in Jakarta, paired with iced tea. I had an embarrassing moment when I was about to order one. I told my friend (good thing I didn’t directly order at the counter!) that I wanted a nasi goreng, but without the rice, since I was on a diet. I tell you, she laughed so hard! 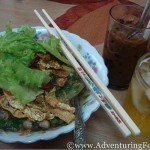 Nevertheless, I enjoyed eating it, everywhere from posh restaurants to hawker food carts. The selection was limited the time I was there since it was the Ramadan, but I had more than enough to satisfy my palate. 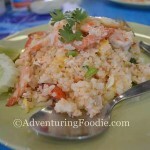 What makes nasi goreng different from the usual fried rice is its buttery flavor. 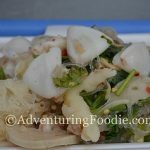 Yes, this sinful dish is chock-full of carbohydrates as it is stir-fried in butter or margarine. Add to that a mixture of chicken or shrimp plus the crunch of vegetables—instant happiness (not to mention calories)! 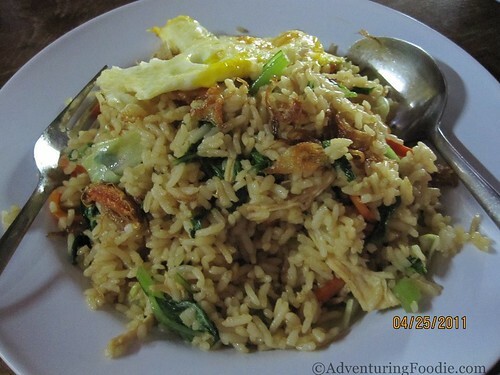 Among those that I tried, the one I liked most was the nasi goreng I ordered at a warung (roadside eatery). It had a simple and fresh taste from the chicken and veggies. Topped with fried egg, it was a complete meal in itself! 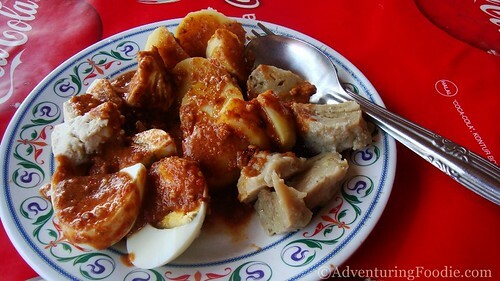 Just like the Philippines, Indonesia is a melting pot of different tastes. In a sense, there is no standard “Indonesian cuisine” but rather, a mixture of a variety of flavors formed from the different regions and influenced by a diverse and complex cultural history.